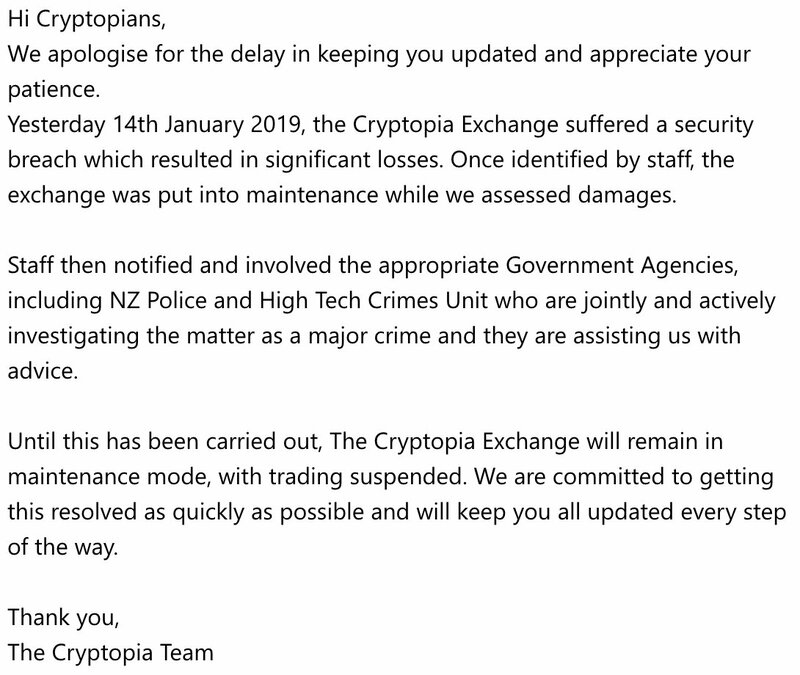 Beginning the 13th of January, users of the New Zealand based cryptocurrency exchange of Cryptopia started experiencing technical difficulties with their accounts. The exchange went on to announce via twitter that they were carrying out an unscheduled maintenance to sort out the issue. The initial tweet by Cryptopia can be found below. The exchange went on to tweet two more times that they were still carrying out an unscheduled maintenance. The two tweets can be found below. Visitors of the Cyrptopia website, are also being informed of ongoing maintenance via the following message. It is with the above background that the exchange has issued one more tweet explaining the crypto exchange had suffered a security breach that resulted in significant losses. The team at Cryptopia also informed its users that they have notified all relevant Government Law Agencies in New Zealand. According to the tweet, the exchange suffered the attack on the 14th of January. All trading and movement of funds in and out of the exchange, has also been suspended. No additional information has been provided by the exchange at the moment of writing this. A copy of the message provided on twitter by the exchange can be found below. Many keen crypto traders and enthusiasts are curious as to how the crypto markets will handle news of the hack that was carried out on Cryptopia. One needs to only remember the market after-effects when exchanges were hacked in 2018. News of exchanges being hacked were accompanied by flash selling. Checking the crypto markets, we find that the total market capitalization is stable at $122.482 Billion with Bitcoin (BTC) trading at $3,673. A majority of the top 100 cryptocurrencies are also in the green and exhibiting moderate gains after the weekend bloodbath. However, a full 24 hours might be necessary to gauge the effect of the Cryptopia hack on the general feel and mood of the crypto markets. What are your thoughts on news that Cryptopia has been hacked and significant losses incurred? Please let us know in the comment section below. Disclaimer: This article is not meant to give financial advice. Any additional opinion herein is purely the author’s and does not represent the opinion of Crypto Treat News or any of its other writers. Please carry out your own research before investing in any of the numerous cryptocurrencies available. Thank you.